This is a story about the importance of love and family over all else. I don't make a habit of reading or reviewing children's books, but once in a while an invitation to do so comes along and I shrug and agree. It's nice to read something simple once in a while, you know? This is an extremely simple book. Each two-page spread has just a few pages of text, and the rest of the paper is taken up with illistrations. We see the boy exploring a large variety of different homes, from a big mansion to a farm to a trailer park and a bird's nest. Each home seems like a pretty cool place to live, with nice and friendly people and fun things to do, so the boy's realization that his home is the best (because it has his family) seems a little bit of a leap. It's perfectly true, though. And I think parents and kids would enjoy reading this simple story around bedtime. 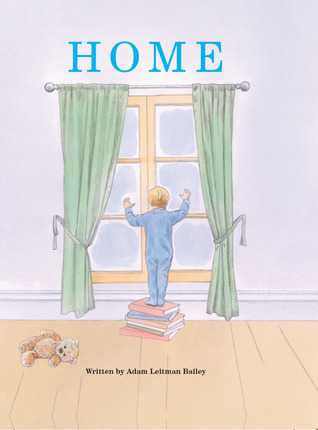 The illustrations are peaceful and pretty, in the same style as on the cover, and the book on the whole is a nice, pleasant bedtime story which parents hopefully won't get too sick of even after many repetitions.